Many suffragists spend more money on clothes than they can comfortably afford, rather than run the risk of being considered outré, and doing more harm to the cause. – Sylvia Pankhurst (1882-1960), English suffragette. I recently read an article in The Guardian by fashion author and lecturer Cally Blackman about how women of the suffragette movement recognized the role of fashion in reaching their goals. “Haunted by the stereotypical image of the ‘strong-minded woman’ in masculine clothes, pebble-thick glasses and galoshes created by cartoonists, they chose instead to present a fashionable, feminine image,” says Blackman. The approach worked, with increasing membership and a certain cachet in sporting the suffragette color scheme – purple for loyalty, white for purity, and green for hope. This early branding was helped along by Selfridges and Liberty department stores, who sold tricolor striped ribbon to adorn hats and make belts and badges. 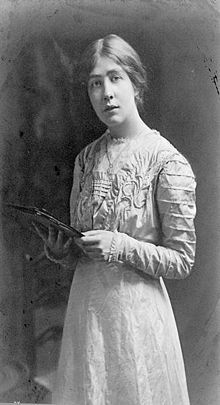 Trained as an artist at the Royal College of Art, Sylvia Pankhurst designed for the cause much of what today we would call marketing material. Speaking of all this women’s lib stuff, did you know that October 23rd is the US release of the film Suffragette? The London premiere a couple of weeks ago was quite the affair with protestors storming the red carpet. Not to protest the movie but simply to use the event to bring attention to their cause against domestic violence. 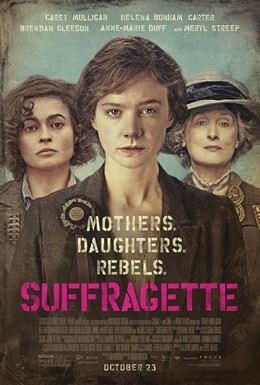 In Suffragette our own Meryl Streep stars as Sylvia Pankhurst. Helena Bonham Carter and Carey Mulligan round out the cast. What I want to know is – will we see 1900s-influenced fashions next year?